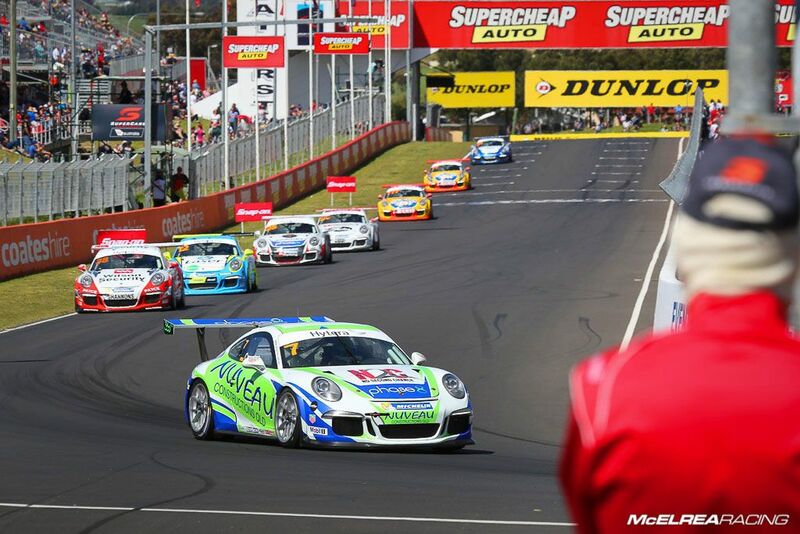 Like the Sandown three weeks ago, McElrea Racing's 'Super Coach' Luffy was co-driving with Garth Tander for the Holden Racing Team and looking to back up their Sandown 500 victory. Matt Campbell was looking to extend his championship lead in the Carrera Cup championship and back-up his impressive V8 debut at Sandown in the Nissan V8 Supercar with Todd Kelly. Matt had a 37.5 point lead in 'Pro' class and Shane was second and 49.5 points behind the leader of the TAG Heuer Challenge. 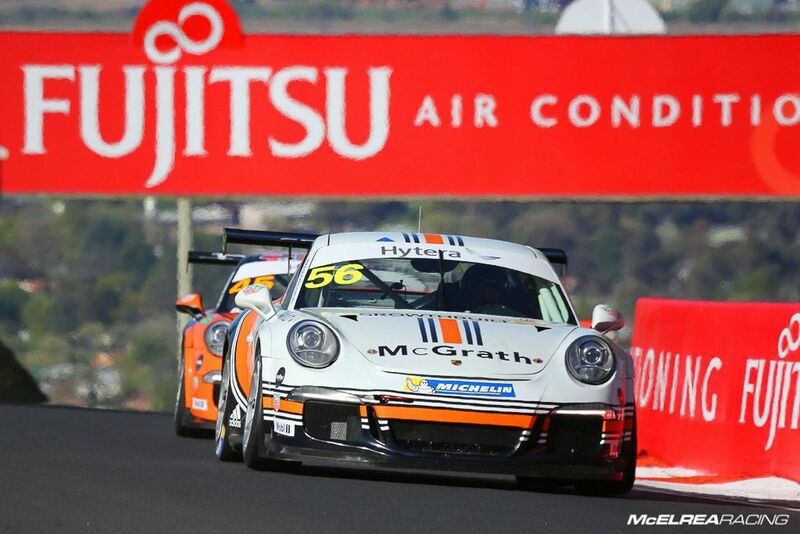 We were also coming to the formidable Mt Panorama circuit having won five of the last six rounds including the last three consecutive Bathurst Carrera Cup rounds. 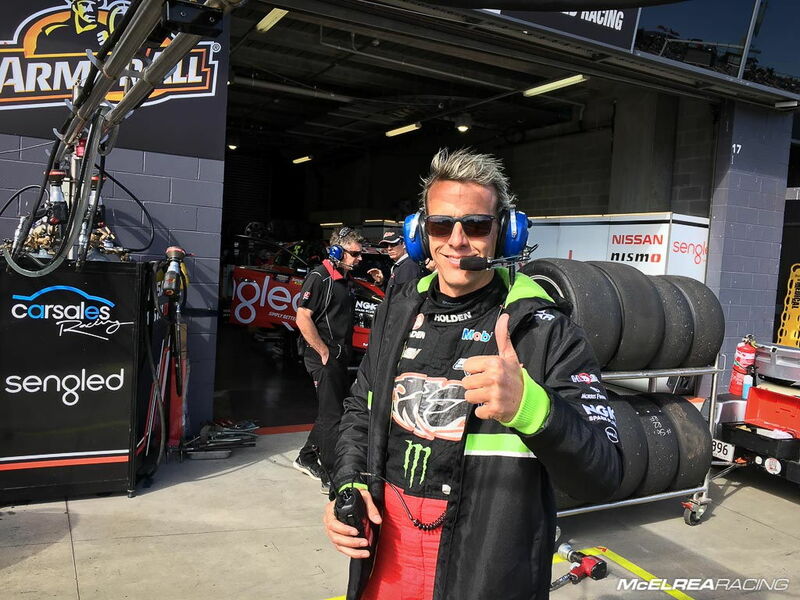 Resident MR Driver Coach Warren Luff was on double duty driving in the main event with Garth Tander for the Holden Racing Team. Matt was able to claim a record breaking sixth straight pole of the season. At the start of race one he got a good start as did David Wall from grid 2. After a drag race to turn 2 Matt sat behind Wall with enough pressure on to force a mistake on the second lap and make a clean pass into turn 2. He then pulled a two second lead to the finish. In race two Matt got a great start and led Wall into turn 1. Steve Richards stayed close behind for a couple of laps then Matt pulled a three second lead until a safety car period which concluded the race. In race 3 Matt was beaten off the line by Steve Richards who lead for 3 laps until he made a daring pass on Richo into 'the Chase' and proceeded to build up a solid 2 second lead at the flag. This was an impressive performance given he was switching between a front engine RH drive 650HP Nissan V8 to our rear engine LH drive Porsche all weekend. Shane qualified on pole in Tag Heuer Challenge (for semi-professional drivers). In race 1 Shane got a good start and did a great job running among the pro drivers and well clear of championship contender Bates, who eventually crashed out of race 1 handing Shane a relatively easy run to his first win of the weekend. In race 2 he was leading (the Tag Challenge) but was a touch impatient trying to pass a guest driver into the cutting and tagged the fence causing himself a very unwelcome DNF. In race 3 Shane drove a fairly conservative but safe race to finish 4th. Due to the race 2 incident Shane has dropped to third in the championship 99 points behind Bates and 1.5 behind Bergmuller. With 180 points available at the final round, we won't give up until the last lap of the final race of the season. Duvashen qualified 10th in Pro class. In race 1 he had an unfortunate spin which dropped him down to 18th outright but he recovered to finish 12th in Pro class. In race two he got a great start but was boxed in by traffic which ultimately dropped him down to 15th outright. Although he only got a couple of laps in clear air before the safety car intervention he managed to race his way back up to 12th. In race 3 he ran his new set of tyres which we had saved, hoping for extra grip and a great result in the final race. Although he got a decent start wasn't able to capture the extra speed we had hoped for and settled for a relatively quiet run to 10th. James qualified 12th in Pro class. In race 1 he was taken out while making a fair pass on a semi-professional driver which dropped him to 15th outright. He drove well to come back up to 11th in Pro class with a damaged car. In race two he produced an excellent drive racing hard and eventually winning a battle with fellow young gun O'Keeffe getting to 10th by the chequered flag. Unfortunately the final three laps were run behind the safety car which cost him the opportunity to challenge ex V8 Supercar driver Dean Fiore. In race 3 James completed the first mission given to him before the weekend, which was to finish every lap of every session to gain the experience needed for a championship campaign in 2017. He diced with O'Keeffe again finishing up with a great top 10 result. 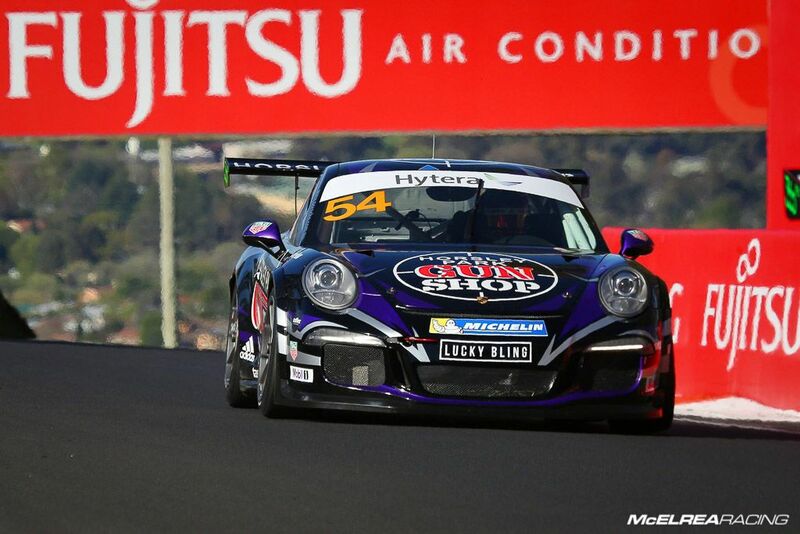 It feels extraordinary that we were able to win our fourth consecutive Bathurst round and five of the last six rounds at Mt Panorama with four different drivers! 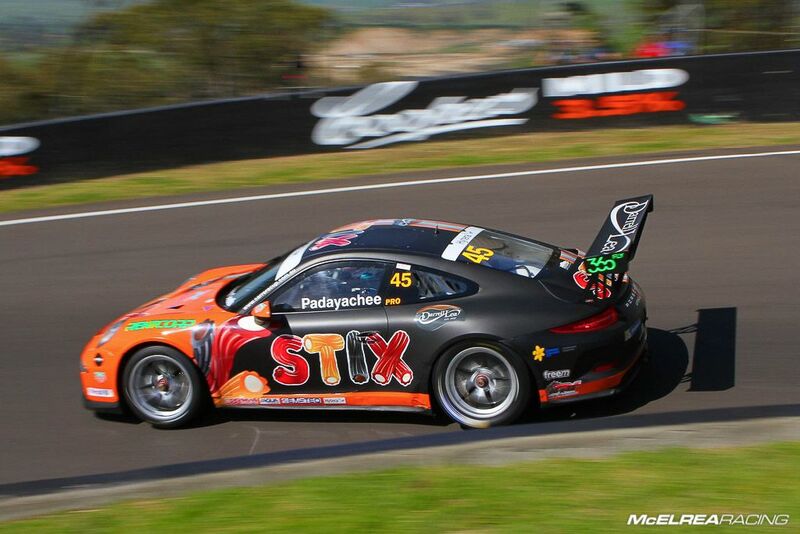 Matt now has 124 point lead over our 2012 lead driver (and great mate) Alex Davison. With 180 points available at the final 2016 Carrera Cup round Matt has to finish ahead of Alex in one race to take the championship. Shane's DNF in race 2 dropped him to third in the Tag Heuer Challenge Championship. James had another great weekend and got plenty of experience at 'the mountain' in preparation for next season. Through no fault of his own Duvashen didn't have the weekend he was hoping for after being in the wrong place at the wrong time in the first two races. 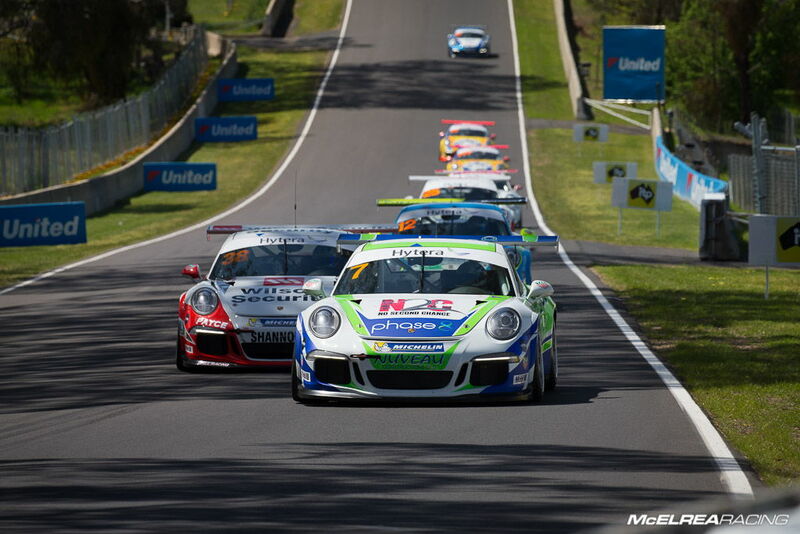 The awesome MR crew has less than two weeks to prep our cars for the final Carrera Cup round at our home track, on the mean streets of Surfers Paradise. Dig out your boardies or bikini and see you there! Thanks to Darin Mandy from Digital Realism for the great action shots.